Scan. Queue. Order. Eat. This is the order of behaviour in which most people arriving at a street food market tend to follow. It's a fast game, this one, because often you won't know how many bacon and egg butties or pork belly bao there are left – until they've sold out. But hold up a second. When deciding which thing(s) to eagerly pile into, how often do you take sustainability factors into consideration? And if you do already, how can you suss out whether a street food trader is really sustainable or not? There is good news from Andrew Stephen, CEO of the Sustainable Restaurant Association, who believes that while traders still have lots to do with regards to catering disposables and waste, the quality of street food "has improved beyond all recognition and with it, many traders have upped their game in terms of the provenance of the ingredients and their concern for the planet." 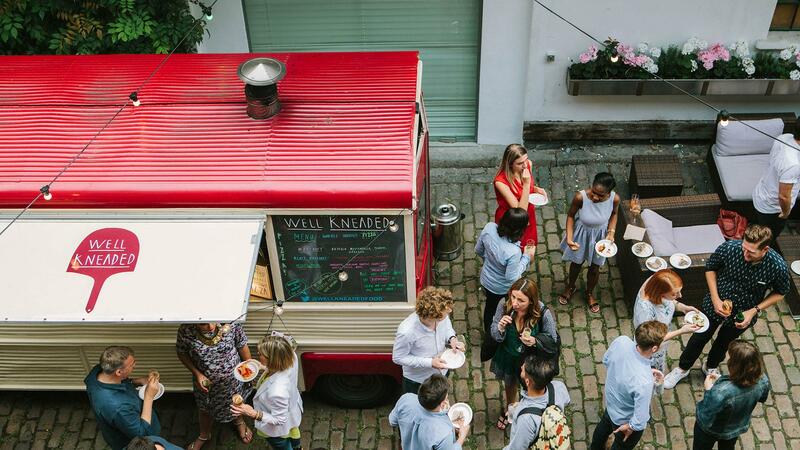 Having taken a few of the key points – suppliers; compostable cutlery and plates; power; waste and its disposal; fuel saving – suggested by the SRA into consideration, here are five of London's most sustainable street food traders. 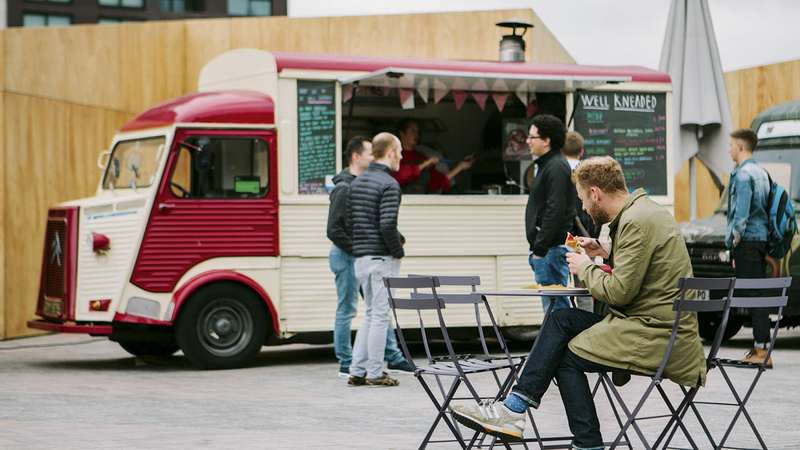 What: Fresh, fast, sustainable British street food served from two Airstream trailers, a restaurant and a hatch. Seasonal dishes include bacon, sausage and free-range egg brioches, roasted chicken or rare-beef sandwiches, hot-smoked salmon with cabbage and kale salad, and sandwiches sold by the inch from the restaurant on Broadgate Circle. Who: Chef founders Mark Jankel and Jun Tanaka started their business in 2012. Tanaka is now heavily involved in running his restaurant The Ninth, with Jankel in charge of Street Kitchen day to day. What sustainability means to them: "Sustainability is not measurable so one can only aspire to be better each day," says Jankel. Both are passionate about working directly with farmers and considering their use of energy and water "in order to better understand our impact and act accordingly to reduce it." How sustainable? They work closely with their suppliers, whom they list on their website and who include Riverford Organic and Piper's Farm. As for packaging, everything – including gloves – is compostable, while they have three bins for recycling and food waste. They use low-power ovens called Thermodynes, and have three burners on the grill - "when it slows down we cut down to one burner." What: British produce-led dishes, often involving unfashionable cuts of meat such as tongue, ear, and cheek. 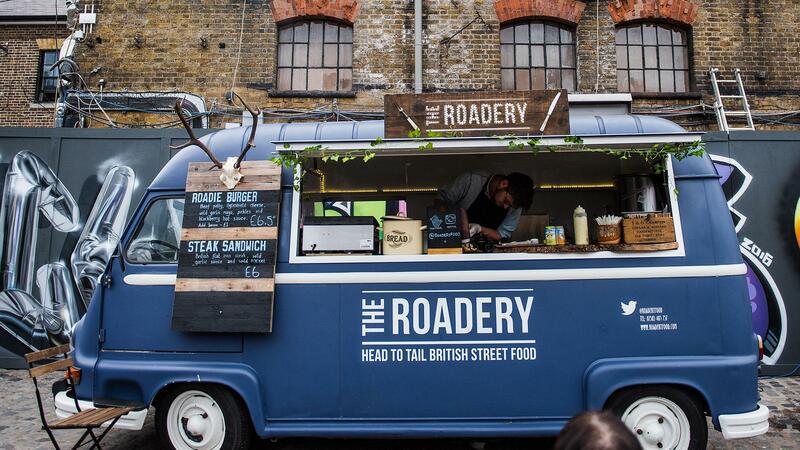 Served from a 1979 Renault Estafette van at Camden Stables market and at various festivals. Who: Dan Shearman, who grew up foraging with his parents in the Forest of Dean and after various cooking stints in Australasia, came back to continue under his own name. He has been running The Roadery since 2014. What sustainability means to them: "It's the number one priority across everything we serve and the way we operate our business." How sustainable? Food-wise, Shearman uses "as of the animal as possible", and ensures that all produce comes from "small, local, organic and family-run British farms, where animals have lived the best possible lives. We also forage for a lot of our ingredients in and around London, so that certainly takes our food miles down as it's woodland-to-plate!" Shearman recycles cardboard, separates food waste, only uses biodegradable packaging and cutlery made from plant starch, and believes it's "a positive step" that "a lot of festivals now insist on all [compostable] packaging." A leisure battery is used to the power lights and fridges, and a bio-diesel generator for anything larger. What: Wood-fired sourdough pizza made in a Citroen H van (and a free-wheeling oven called Whippet) with British ingredients, regularly found at Bloomsbury market, West India Quay, and various festivals. Who: Director Bryony Lewis works alongside the company's founder Bridget Callaghan, who worked for a chocolate company before doing detached youth work, prior to setting up Well Kneaded four years ago. What sustainability means to her: A lot, particularly in relation to who they employ. They partner with the charity EMERGE, which Callaghan describes as being "at the very heart of Well Kneaded". How sustainable? Staff are young people who have faced social barriers to employment, "such as prison, families without employment networks, bad education and learning difficulties." Their ingredients – except tomatoes, which are Italian and have protected status – come from British artisanal producers with high welfare standards (for example Bath Pig and Cobble Lane Cured). Meanwhile, they use recyclable containers and fire the oven by burning a mixture of hard and dry wood from places with sustainable planting policies. They also specifically choose markets or events that are "always busy" so nothing burns for longer than is actually necessary. 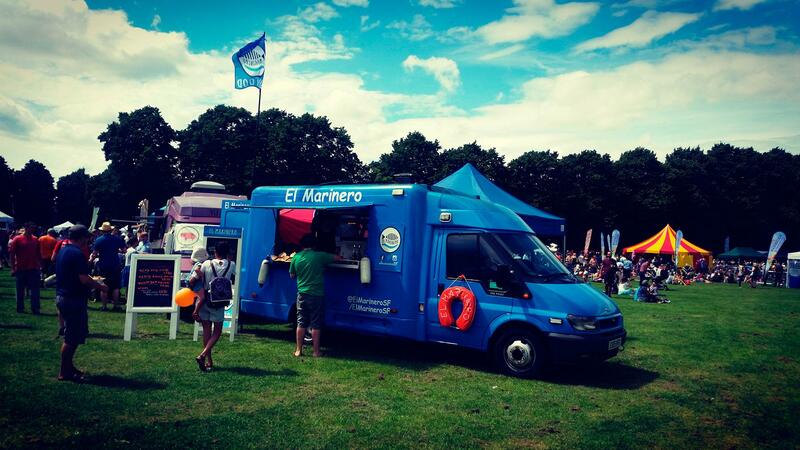 What: A stall and a catering van specialising in excellent seafood recipes inspired by the region of Galicia, such as seafood stew, or king prawns a la plancha. All served from an ex-Essex Ambulance Ford Transit van at Street Dots, Truck Stop and Epicurean world food markets. Who: Chef David Ruibal Romero did a degree in catering in France, and has a CV stuffed with every kind of cooking job imaginable. What sustainability means to him: "It means a lot to me and is quite important for my business. It ensures our activity doesn't impact the future generations. I would like the consumer to be more aware of sustainability issues." How sustainable? He buys seafood from Billingsgate and his products are either MSC certified (wild seafood) or BAP certified (farmed seafood), to ensure high quality standards are met. Romero says that "gas is carbon and money so I adjust my burners according to the activity and make sure I use as little as possible." He has one bin for health and safety reasons but only generates rubbish during deliveries and prep. All food-related items are composted either in his garden or compost bin. Romero's packaging is compostable, his van has a diesel engine but uses the greener LPG for cooking and electricity for the fridges. An on-board battery system powers the lights and water pump. 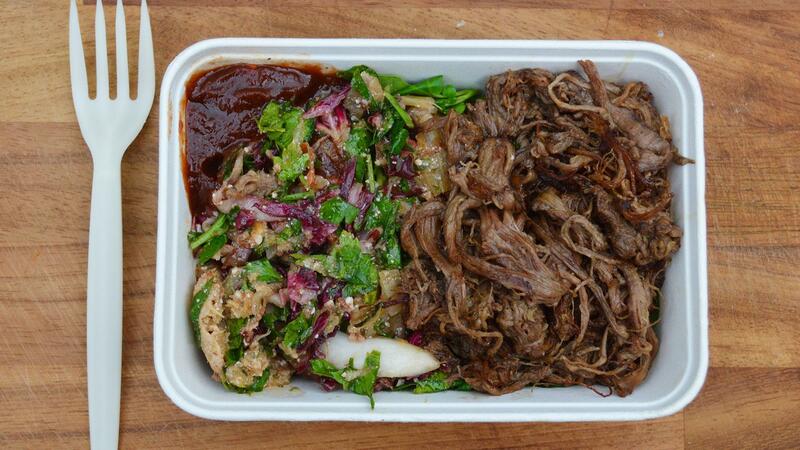 What: Billed as Eastern Mediterranean village food, this is based around kid goat meat and veal and served from a fixed unit at Borough Market. On the menu, you'll find slow-roast rose veal, kid goat kofte wraps with lemon juice, parsley and mint. Winners of BBC's Food & Farming Street Food of The Year Award 2016.
Who: Nadia and Nick Stokes, a former lawyer and teacher respectively. Nadia grew up in Cyprus and wanted to serve the food of her childhood. Trading since 2014. 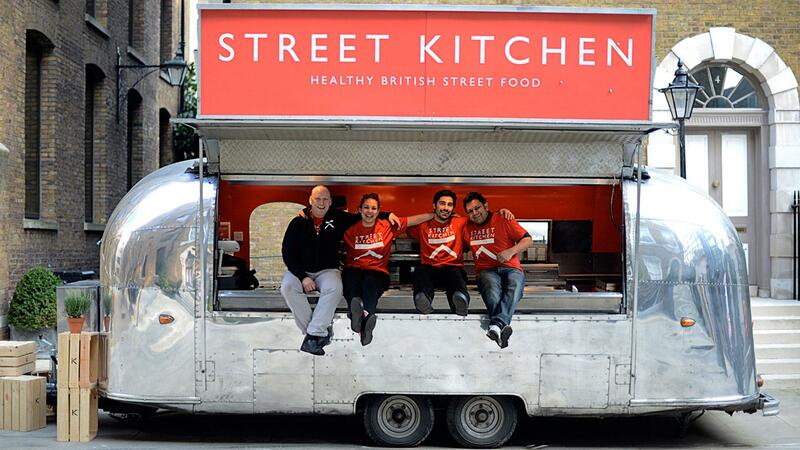 What sustainability means to them: One of the few Slow Food UK-approved street food traders, they are also currently shortlisted for the Sustainable Streetfood category at the Urban Food Awards (to be announced imminently). How sustainable? The concept is based around it. Kid goat meat, they say, keeps dairy billy goats from being slaughtered, and in turn supports the dairy industry, and the same goes for dairy bull calves and veal meat. The Stokes also cook with vine leaves, pulses, whey cheese and squid, all from sustainable sources. All serving pots and forks are recyclable and biodegradable, they recycle any cardboard used, and offer leftover food to others at the market.